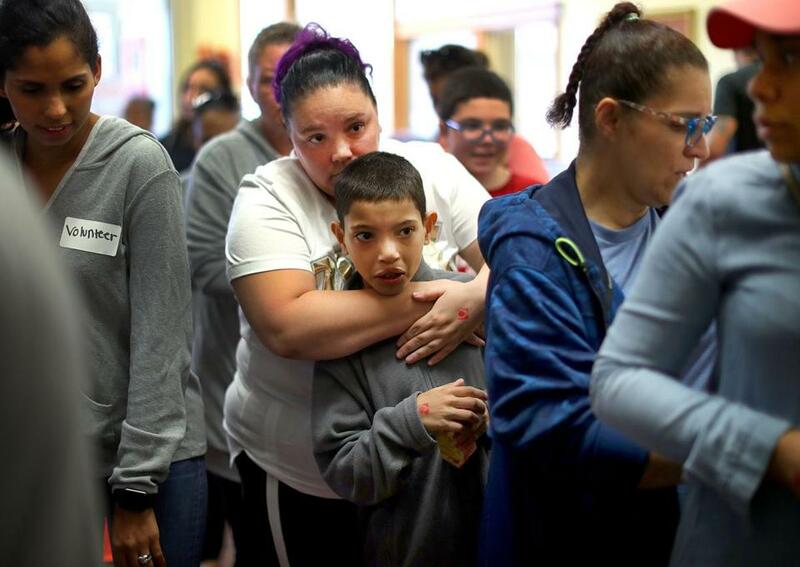 Zulaika Garcia waited with her son, Joseph, 9, at the Lawrence Senior Center where a food pantry was set up. LAWRENCE — The roads back home were closed, so they walked. One by one and two by two, alone and together, a steady caravan of residents-turned-refugees beat a path across the Merrimack River on Friday, returning to their homes to retrieve only what they could carry back by hand. Medications packed into a black plastic toolbox. School supplies in a Sterilite bin. Children’s clothes in a gift bag covered in pink lettering: Sweet Baby Girl. A day after their entire neighborhood seemed to burst into flames without warning, people struggled to describe the panicked scene that ensued without calling on scenes from Hollywood apocalypse thrillers. But Friday was what happens after the movie ends: The fires were out, but so were the power and gas. 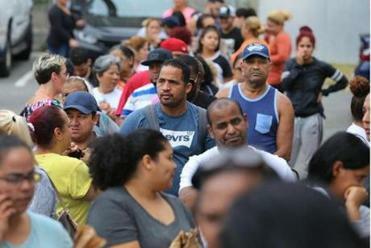 Many — hundreds, at least — had evacuated in a panic, abandoning their belongings, leaving their lives behind. Now, save for the occasional sirens and cellphones chiming with emergency messages, the neighborhood was oddly silent. As many as 80 buildings burned in Lawrence, Andover, and North Andover, with one person dead and at least 13 injured. Thousands of people fled, and now officials and residents are trying to understand what happened and why. With no clear idea of when they’d get their homes back, and police barring nonemergency vehicles from entering the neighborhood, it was time to reclaim what they could carry: Clothes. Toothbrushes. Blood pressure pills. And, in the wake of a terrifying and deadly ordeal, each other. This is the Lawrence you don’t hear much about — the Lawrence you don’t know unless you spend some time there. The Lawrence that walks in when the roads are closed. The Lawrence where people carry each other. 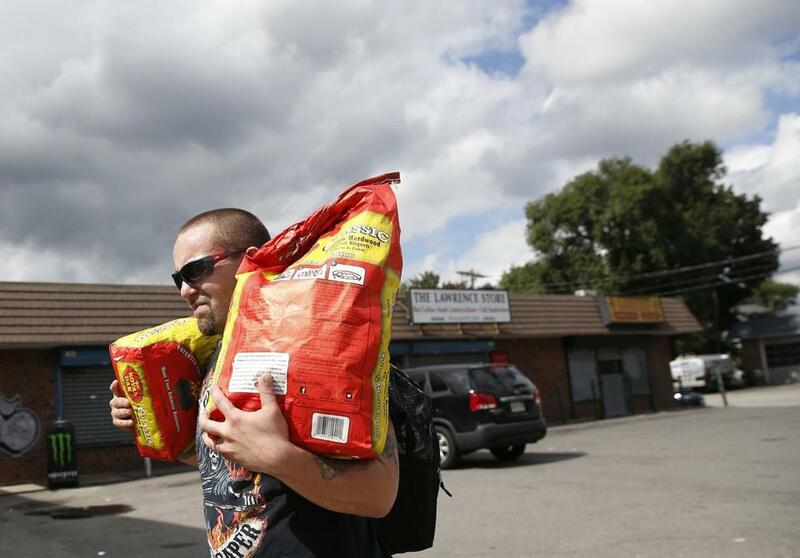 A man carried bags of charcoal down South Union street as he walked back into South Lawrence. “People have to come to Lawrence to see what Lawrence is about,” said Maria Rosario, 32. On Friday, during an hours-long exodus across the Merrimack River, you could see. Ramon Rojas and Joby Hilton carried power tools across the bridge so they could get back to their construction job in town — a Sawzall and a framing nailer, a long level and circular saw. Leo Vieira pedaled a sparkly purple child’s bicycle across the bridge, carrying a bag with his son’s asthma medicine inside and hauling a trailer with his two small dogs. Francisco Gomez and Andrea Rodriguez carried rosaries, and backpacks full of clothes back from their house on Everett Street. Lawrence is sometimes called the City of Immigrants, and the scene on the Joseph W. Casey Bridge on Friday recalled the huddled masses to which this country once beckoned. But the truth is that most of us are just one big disaster away from packing what we can carry and trudging to safety. A gas main, a hurricane, a market crash: Next thing you know, you’re wheeling your belongings across the sidewalk. Felicia Frias came back for her cat, Jynx. Jordany Moreno and her sister, Carmela, came back to feed Jordany’s canary, Rio. They grabbed their passports, Social Security cards, and birth certificates, along with some bread and clothes. Sonia Vazquez and her mother, Estela Vazquez, carried oversized bags of supplies to care for Estela’s 72-year-old mother, who had evacuated by riding downstairs on her stairlift’s last bits of battery power. Jose Melendez rolled a big cooler full of meat up the hill on Parker Street toward the bridge. Steaks, sausages, hot dogs — he’d packed it with ice and lugged it up the 10 blocks from Farnham Street so it wouldn’t go to waste. Sebastian Perrera had a different idea. He’d spent the night in his Front Street home, then marched out and carried a bag of charcoal back home; if the stove wouldn’t work, he’d grill the burgers in the fridge before they spoiled. In a city and a neighborhood where a week’s worth of groceries can’t be abandoned without straining the family budget, people hauled the contents of their warm refrigerators in wagons: fruit, milk, juice. A few men carried birthday cakes up the hill, from a bakery that had lost refrigeration, and began passing out the inventory. Mostly, though, they carried clothes. Clothes in rolling suitcases and clothes in old shopping bags. Clothes in trash bags slung over tired shoulders and piled in wagons. Bernie Rosado lugged a suitcase loaded with his 3- and 6-year-old’s clothes across the bridge, back to his car and to the house in Methuen where they were all staying until it’s time to come home. 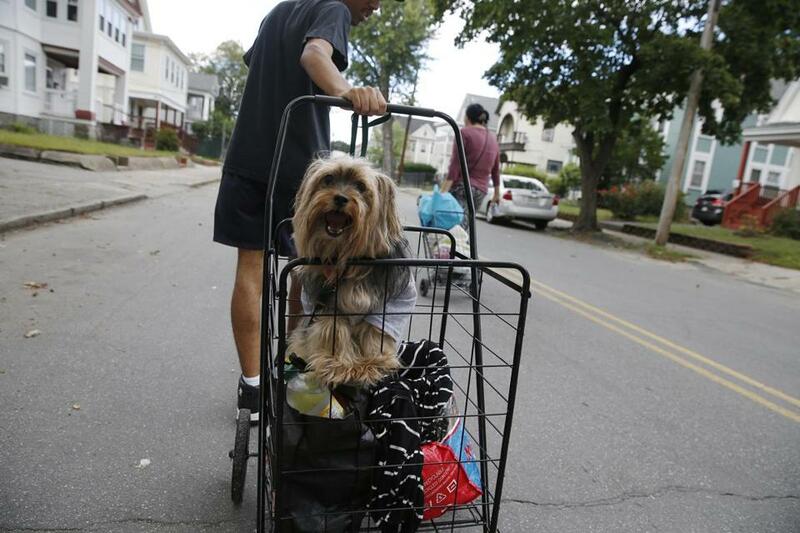 A dog named Jasper hitched a ride inside a cart with his owner’s other belongings in South Lawrence. In a catastrophe this big, why were there so few injuries and deaths? Editorial: After the fires, who will pay for damage? Nestor Ramos can be reached at nestor.ramos@globe.com.